"Read Larry Berman’s well-researched book and you’ll understand why victory was never truly within the United States’ reach." Q: Why did one of the great spies of our century allow me to be his American biographer? Q: How did you meet Pham Xuan An? Q: Why did Pham Xuan An allow you to write about his life? Q: Where did you conduct research for the book? Q: What does it mean to be A Hero of the Revolution? Q: Do you think Pham Xuan An was an agent of disinformation by influencing Time’s coverage of the war? Q: Who was the real Pham Xuan An? Q: Was Pham Xuan An responsible for the deaths of Americans? Q: Why Did An admire the American people? Q: You say that Pham Xuan An’s life serves as a window on the war. What can be learned from his life? Q: When did you last see Pham Xuan An? Q: How is An likely to be remembered? A: During the Vietnam War, Pham Xuan An was a highly respected Time Magazine reporter who turned out to be a spy for the North Vietnamese. He was a trusted source for the era’s best known reporters; his circle extended well beyond journalism to include the CIA’s Lou Conein, Edward Lansdale and William Colby. He was friends with the most notable South Vietnamese politicians and generals. Working for Time provided the perfect listening post and information access point for a spy. The Communist Party recruited An as espionage agent X6, a lone cell member of the H63 intelligence network in Cu Chi. The Party chose a career in journalism as the best cover and developed a carefully scripted artificial life history, beginning with An’s trip to the United States in 1957 where he attended college as a journalism major. For the next twenty years An lived a lie and no one suspected because he was so good at his day job. An’s success later earned him promotion to Major General and Hero of the People’s Army-- one of only two intelligence officers during the war ever promoted to the rank of General and Hero. When I first met An in July 2001, we spoke about a range of subjects, but never espionage. An was interested in my forthcoming book, No Peace No Honor: Nixon, Kissinger and Betrayal in Vietnam. He asked if we could meet the next day at the Givral coffee shop, located across the street from the Continental Hotel and within earshot of the National Assembly building. During the war Givral had been the gathering spot for journalists, correspondents, police and government officials—the place where rumors started, were tested for their staying power and where everyone hunted for the best story-line of the day. An held the title “General Givral” because it was here that he could be found dispensing tips that were so timely it was rumored he must be CIA. In 2003 An became seriously ill with emphysema, spending five days on an artificial lung. His wife, consistent with Vietnamese tradition, placed many of his documents, notes, photos and other materials into a coffer so that An could be buried with his secrets. An did not die, returning home with just 35% lung capacity remaining. An oxygen tank was stationed nearby and about two hours into our conversation, An said he needed to lie down and take oxygen. He invited me to browse through his library. I began reading the personal inscriptions in An’s books. 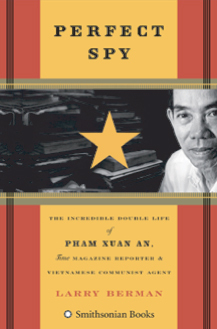 “To Pham Xuan An—My friend, who served the cause of journalism and the cause of his country with honor and distinction-fondest regards,” wrote Neil Sheehan. “For my dearly beloved An, who understands that governments come and go but friends remain forever. You have been a grand teacher, but a gigantic friend who will always be part of my heart. With love, and a joy in finding you after all these years,” wrote Laura Palmer. “For Pham Xuan An-A true friend through troubled times we shared in wartime. My very fond regards,” wrote Gerald Hickey. “To Pham Xuan An, a courageous patriot and a great friend and teacher, with gratitude” wrote Nayan Chanda. “To Pham Xuan An, the present finally catches up with the past! Memories to share and to cherish—but most of all a long friendship,” wrote Robert Shaplen.“For Pham Xuan An, my kid brother, who has helped me to understand Vietnam for so many years, with warm regards,” wrote Stanley Karnow. “For Pham Xuan An—who taught me about Vietnam and the true meaning of friendship. To you, the bravest man I have ever met, I owe a debt that can never be repaid. Hoa Binh,” wrote Robert Sam Anson. I needed to write this story—about An’s life as an intelligence agent during the war, his career in journalism, his years in America, his friendships—the story of war, reconciliation and peace. I beseeched An to recognize that his biography should be written by a historian like myself and not just by journalists in Vietnam where the censorship boards he ridiculed still operated. An looked me straight in the eyes and said “OK,” telling me that he respected my previous books on Vietnam and he hoped young people in America could learn from his life about the war, patriotism and his admiration for the American people. He promised to cooperate with only one caveat, reserving the right to say “that is not for your book, because it may hurt that person’s children, but I tell it to you so you can see the rest of the picture, but please, never tell that story or give that name.” Through our last day together, An remained very concerned that something he might say would have adverse consequences not for him, but for others. In every instance I honored his request. He also told me that he did not want to read the manuscript until published, citing a Vietnamese phrase “Van Minh, Vo Nguoi.” An was telling me that he could always find something in my writing that he did not like, but he would not sit in judgment of his biographer’s conclusions since he had chosen not to write his own story. That was our deal; in exchange, I had unparalleled access to a spy. I was consumed with a sense of urgency. An was very weak and always spoke about death. “I have lived too long already,” was his mantra. Now that I had authorization, I decided to visit as often as possible, never knowing when he would be gone. It was because An knew his end was nearing that he opened up more and more, providing me with documents obtained during the war, dozens of personal photographs and correspondence, access to members of his network, friends in the United States and, most important, a visit to the back of his home filing cabinets—old and rusting metal chests in which dozens of mildewed documents are stored. I caught An at the same stage as Doris Kearns did with Lyndon Johnson, in the winter of life when a person accepts that their end is near. Still, how could I be sure I was not just getting the final spin from the master spy with the perfect cover? Perhaps An would again demonstrate the same mental discipline and compartmentalization he used during the war, when none of his American or Vietnamese friends really knew him either. His name in Vietnamese translates as “hidden” or “secret.” An’s name was indeed his life. I conducted research in archives throughout the United States, finding much material in the Papers of Robert Shaplen deposited with the Wisconsin Historical Society; in the Neil Sheehan papers at the Library of Congress; in the Frank McCulloch Papers at the University of Nevada; and in the Edward Lansdale Papers at the Hoover Institution Library. I also interviewed dozens of former colleagues and friends, including those who knew An from his time in at Orange Coast College. I would new primary source documents with me on each trip to Vietnam. An’s eyes lit up when he saw the tracks of his life and knew that I was formulating an independent interpretation well beyond what was permissible in his own country. That’s all he wanted at this final stage. An also asked if he could use my mini-cassette recorder to tape farewell messages to some of his old friends in the United States. Too weak to write or type, An wanted to say thank you and goodbye, telling me that I could use whatever he said as background, unless he had already told it to me during one of our sessions, in which case it was for attribution. If the recipient gave permission, I could use it all for attribution. An also asked that I return personal letters sent to him by American friends. Pham Xuan An died of emphysema on September 20, 2006, just eight days after his 79th birthday. His coffin lay in state for two days of public tribute before a funeral with full military honors. Yet, several wreaths at An’s funeral spoke volumes to the An who was not a spy and Hero: “To our beloved teacher Pham Xuan An, we will always cherish your wisdom and friendship,” from the Vietnam Project, Harvard University; “With out deepest gratitude for your counsel and encouragement,” from the Fulbright Economics Teaching Program; “In admiration and loving memory of Pham Xuan An,” from Neil, Susan, Catherine, and Maria Sheehan. For the next two hours, An and I talked about a range of subjects, beginning with his two years at Orange Coast College where he majored in journalism, his travels across the United States and all he had learned from and admired about the American people. An told me he had visited Davis while interning at the Sacramento Bee. He recalled the personal kindness of publisher Eleanor McClatchy and mentioned he had met the Governor of California while attending a journalism conference for college newspaper editors in Sacramento. At the time I was writing a book about the secret Paris negotiations between Henry Kissinger and Le Duc Tho. An launched into a detailed and sophisticated analysis of the negotiations, providing me with new information and a fresh perspective. I thought he was perhaps the most informed person I had spoken with about the negotiations. An never said a word that evening about his job in espionage, focusing instead on the details of his other job as a correspondent for Reuters and Time. He did not tell me that he was Major General Pham Xuan An of the Vietnam People’s Army, the recipient of four Liberation Exploit Medals, six soldier of emulation medals along with the title he held that day, People’s Army Hero. A: With my book on the Paris negotiations published, I wanted to use the story of An’s life as a window for understanding the complexities of the war. I asked An why he had never written an autobiography. An insisted he held too many secrets that if revealed would harm the living and the families of the dead. He would never write about his life as a spy, insisting he was just one cog in a vast communist intelligence network. When I asked if I could write the story of his life, An said no. Still, our conversations continued and I kept pressing my case, beseeching An to recognize that his story should be told by a historian like myself --his life as a strategic intelligence agent during the war, his career in journalism, his years in America, his friendships—the story of war, reconciliation and peace. Knowing that he would never agree to reveal deeply held espionage secrets, I did not press this point. Then one day Pham Xuan An looked me straight in the eyes and said “OK,” telling me that he respected my previous books and he hoped young people in America could learn from his life about the war. He promised to cooperate and told me that my book would be the only authorized biography of his life and he asked members of his intelligence network to cooperate with me. A: I was immediately consumed with a sense of urgency. An was very weak and always spoke about death. I decided to visit as often as possible, never knowing when he would be gone. I made over 15 trips to Vietnam and I think it was because An knew his end was nearing that he opened up more and more, providing me with documents obtained during the war, dozens of personal photographs and correspondence, access to members of his network and friends in the United States. I interviewed over 50 people in the U.S. who knew An. In Vietnam, my most important interviews were with An’s courier Nguyen Thi Ba, his direct supervisor Tu Cang and General Mai Chi Tho, the younger brother of Le Duc Tho. I conducted research in many archives and libraries in the U.S. I also spent quite a bit of time with An's family. An’s mission as a spy was to provide strategic intelligence reports about U.S. war plans and send them into “the jungle,” as he referred to the chain of command. An established perhaps the best and most informed list of sources in Saigon and his name appeared on every list of accredited MACV (Military Assistance Command, Vietnam) correspondents from 1965-1975. An was able to provide Hanoi what it needed most—an understanding of American tactics and battle plans. During the early stages of the American build-up in Vietnam, An was the most valuable of all agents operating in the South precisely because he had already established an almost impenetrable cover. His early reports were so accurate that General Giap joked “we are now in the U.S.’s war room.” Each of An’s Exploit Medals receives detailed attention in the book because An most definitely influenced the outcome of the war. Like so many young people who joined the Viet Minh revolution to fight French colonialism, Pham Xuan An held a vision for Vietnamese independence and social justice. He fought for liberty and against poverty; as a spy he sought neither glory nor money for himself, but everything for the people of his homeland. He did not like being a spy. It was his national obligation and while he took it seriously, there was little joy derived from this type of work. His dreams for the revolution turned out to be naïve and idealistic, but I believe the power of his life story is driven by the noblest of goals for what he saw as Vietnamese nationalism. At first, nothing was more difficult for me in writing about An’s life than trying to understand these friendships. In order to survive An deceived or simply did not tell those closest to him about his mission, yet hardly anyone rejected An when they learned he had been a communist spy. What kind of man can forge such enduring friendships based on a falsehood and, when the deception is unveiled, leave so few feeling betrayed? A: Any account of the life of an acknowledged master spy needs to explore the fact that there were plenty of people—both Americans and Vietnamese—who suffered as a result of communist intelligence activities. Members of An’s H-63 intelligence network “killed many American and puppet troops, destroyed many tanks, armored vehicles and jet fighters of the enemy.” The issue of assessing the impact of particular acts of espionage is a tricky one, but if it is in fact true that An is the greatest Communist spy of the war and that the claims of his “heroic” intelligence network are accurate, then his actions did bring suffering and death to many, albeit often in indirect ways. A: An believed that the United States got in the way of Vietnamese history. This was for the Vietnamese to settle. All An ever wanted for the Vietnamese people was the chance to determine their own future, free from foreign interference. He joined the Revolution imbued with nationalist ideals to fight against colonialism with hopes of creating a new society based on social justice and economic equality. When the Americans came with their advisors and money, followed by their military, An accepted his national obligation to work in espionage. I personally do not believe he enjoyed being a spy and when the war was over, he took special pains to downplay his accomplishments. A: The last time I saw An was in June 2006. 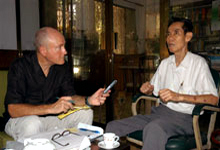 We spent the morning discussing my previous day’s interview with about the Tet Offensive. An began by saying “I am feeling very weak and tired today, so maybe we will speak only for an hour.” Four hours later An said it was time to lie down, always my cue to begin packing up. I was leaving for the States early the next day and said I would see him again in early October, just before the book went into production. "I hope so, but you have enough already, too much,” he said smiling. A: An is venerated and beloved in Vietnam for his contribution to the Vietnamese people’s victory. When he died on September 20, 2006 his coffin lay in state for two days of public tribute before a funeral with full military honors. He is buried beside other espionage agents in a special area of the Ho Chi Minh City cemetery. Your friends will always mourn your loss. Copyright © 2007 polyvizion All rights reserved.